There has been a boom in dinosaur books in the wake of the film Jurassic Park – many of them very good. Good books on other prehistoric animals remain hard to find. 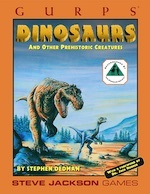 The following titles provide useful information on dinosaurs and other prehistoric life, and were invaluable in writing this worldbook. The Dinosaur Heresies, by Dr Robert Bakker (1986). A well illustrated, very readable, and still controversial explanation of how dinosaurs triumphed over mammals for 130 million years. The Reign of the Reptiles, by Dr Michael Benton (1990). The Rise of the Mammals, by Dr Michael Benton (1991). The Macmillan Illustrated Encyclopedia of Dinosaurs and Prehistoric Animals, by Dougal Dixon and Professors Barry Cox, R.J.G. Savage and Brian Gardiner (1988). Beautiful color illustrations, and very useful information on extinct mammals, birds and reptiles. The Journey from Eden, by Brian M. Fagan (1990). The Fossil Book, by Carroll Lane Fenton and Mildred Adams Fenton, revised and updated by Patricia Vickers-Rich, Thomas Hewett Rich and Mildred Adams Fenton (1989). Wonderful Life, by Stephen Jay Gould (1989). Digging Dinosaurs, by Dr John R. Horner (1988). The Complete T. Rex, by Dr John R. Horner and Don Lessem (1993). The Illustrated Dinosaur Movie Guide, by Stephen Jones (1994). The Cambridge Guide to Prehistoric Man, by David Lambert and the Diagram Group (1987). Origins Reconsidered, by Richard Leakey and Roger Lewin (1993). Kings of Creation, by Don Lessem (1992). The Dinosaur Society Dinosaur Encyclopedia, by Don Lessem and Donald F. Glut (1993). A complete and up-to-date listing of dinosaur species – all 665 of them. Dinosaurs of Australia, by Dr John A. Long (1993). The Dawn of Man, by Steve Parker (1992). Wildlife of Gondwana, by Dr Pat Vickers-Rich and Dr Tom Rich (1993). The Dinosaurs, by William Stout, William Service, and Dr Peter Dodson; edited by Byron Preiss (1981). Dinosaur Tracks, by Tony Thulborn (1990). The Neandertals: Changing the Image of Mankind, by Erik Trinkaus and Pat Shipman (2001). The Dinosauria, by Dr. David B. Weishampel, Dr Peter Dodson, and Dr Halszka Osmolska (eds) (1990). The Illustrated Encyclopedia of Pterosaurs, by Dr Peter N. Wellnhofer (1991). The Riddle of the Dinosaur, by John Noble Wilford (1985). The Hominid Gang, by Delta Willis (1989). The Clan of the Cave Bear, by Jean M. Auel. A Cro-Magnon girl is raised by a Neanderthal tribe. The Lost World, by Sir Arthur Conan Doyle. Much better than any of the movie versions. Jurassic Park, by Michael Crichton. Bio-engineered dinosaurs run amok on a small island. Scarier and more detailed than the movie. Dinosaurs!, edited by Jack Dann and Gardner Dozois. 14 SF stories about dinosaurs, including L. Sprague deCamp's "A Gun for Dinosaur." Dinotopia, by James Gurney. A biologist and his son discover a lost realm where humans co-exist with intelligent dinosaurs. West of Eden, by Harry Harrison, and its sequels, Winter in Eden and Return to Eden., The ultimate "fractured history:" dinosaurs, intelligent reptiles, Cro-Magnons, sabertooths and domesticated mammoth in the same setting. Dance of the Tiger, by Bjorn Kurten. Twin shamans search for a Cro-magnon woman who has taken refuge among the Neandertals. The Many-Colored Land, by Julian May, and sequels The Golden Torc, The Nonborn King, and The Adversary. Time travelers, exiled in the Miocene/Pliocene transition, discover a world ruled by an alien race; a blend of ultra-tech, psionics, mythology, and extinct mammals. Dinosaur Fantastic, edited by Mike Resnick. 25 new SF stories about dinosaurs. End of an Era, by Robert J. Sawyer. Two scientists, with only one gun, visit the end of the Cretaceous. Far-Seer, by Robert J. Sawyer, and its sequels, Fossil-Hunter, and Foreigner. Intelligent dwarf tyrannosaurs discover that their world is an ark. Hawksbill Station, by Robert Silverberg. Political prisoners are banished to the Paleozoic. There are far too many dinosaur and/or caveman movies to list here, but almost no good ones. The ones listed below are at least watchable. Trust me. The Beast from 20,000 Fathoms. Based on Ray Bradbury's story The Fog Horn, with good FX by Ray Harryhausen and Willis Cook. The best of the "dinosaur attacks city" films. Caveman. Slapstick about a scrawny but smarter-than-average caveman (Ringo Starr). The stoned T. rex is a must-see. Iceman. Serious, intelligent movie about a frozen Cro-Magnon revived in the 1980s. Jurassic Park. Good acting, technical advice from John Horner, a plausible story with only minor flaws, and the best dinosaurs ever seen on screen. It also cost more than has ever been spent on dinosaur research. King Kong (1933). The 1976 remake is devoid of dinosaurs, and should be avoided on this account, but has its moments, depending on the viewer's feelings about Jessica Lange. The 2005 version by Peter Jackson is a CGI SFX feast for the eyes. Quest for Fire. A good compressed-history adventure, filmed in Dinosaur Provincial Park, with spoken and sign languages invented by Anthony Burgess and Desmond Morris, and wonderful mammoths. 2001: A Space Odyssey. An alien artifact kick-starts human evolution by teaching Australopithecines to use weapons. The Dinosaur Encyclopedia, by Graeme Worth (1994). The Dinosaur Report is published quarterly by the Dinosaur Society, and contains the latest information on dinosaur discoveries. Good articles on dinosaurs and other prehistoric life can often be found in Discover, Science News, Scientific American and New Scientist.